i rock paper and scissors: The Paper Bakery | Welcome December! The Paper Bakery | Welcome December! The tree is up, "Buddy" our Elf on the Shelf has returned and even though the thermometer says 82°, our thoughts have definitely turned to Christmas. I even scrapped a Christmas photo! A photo from Christmas Eve 2012, the little kids baking cookies for Santa and the "Holiday Charm" scrapbooking kit from the Paper Bakery. 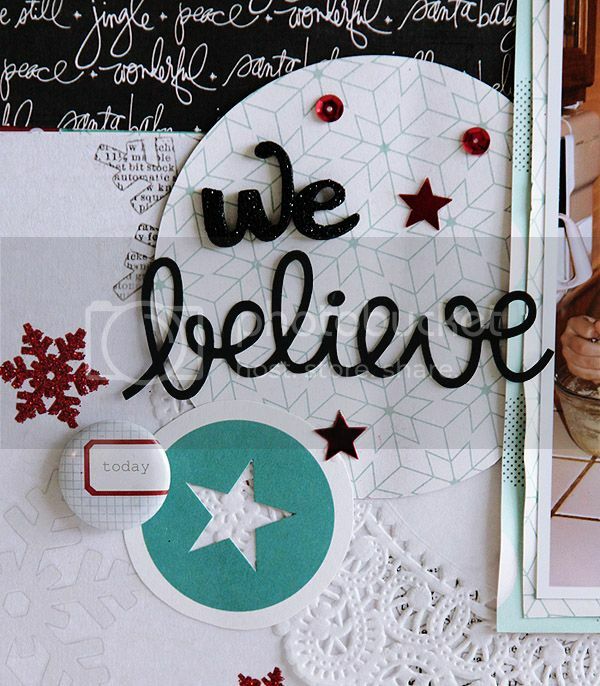 I love the Teresa Collins glitter snowflake paper and the Heidi Swapp black script paper together, such a pretty contrast! I added in some shiny red sequins from the Paper Bakery shop, and a few red stars from my stash. Great layout. I like your black paper and the text snowflakes. Gorgeous!!! I love love love love the colors, the doily and the snowflakes!!!!! This layout makes me want to go shop for new stuff. I love it! I must stay frozen. I must stay frozen. Such a beautiful layout. Love all the little touches you added. Aww, it looks great! The black and red is so pretty! I love those two papers combined too. I had never thought of baking cookies on Christmas Eve but I am sure Miss Three would love to make the cookies we leave for Santa. Love that photo Mary Ann! And I love how you mixed the Heidi Swapp and Teresa Collins papers for your background!